This week's edition of THE SUNDAY WIRE is on the road broadcasting LIVE from the Valley of the Sun. This week host Patrick Henningsen covers this week's top stories in the US and internationally. In the first hour we'll cover the new claim that a CIA 'secret report' implicates Russia in trying to help Trump get elected, as well as MSM pumping out their own "fake news." Then we'll be joined by Syrian Member of Parliament from Aleppo, Fares Shehabi, to ... See More discuss the recent liberation of Aleppo's Old City, and the western media's false and deceptive portrayal of the day to day situation in Syria, as well as the challenges ahead for Syria now 5 years in to this geopolitical proxy war. 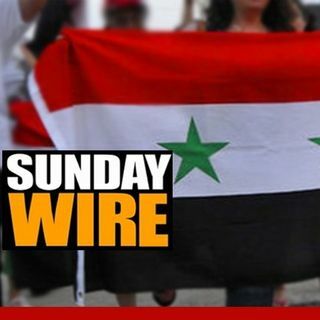 After that, we'll be joined by 21WIRE special contributor, Vanessa Beeley, on the ground this week in Aleppo (see her DONATE button, left) as she investigates the aftermath of 4 years of terrorist occupation in Aleppo's eastern districts. We'll also reveal new information about the US-UK-backed fake NGO known as the White Helmets who are now firmly connected to terrorism in Syria. Fares is absolutely correct. The US is supporting Al Qaeda, Al Nusra and ISIS in Syria. There is no doubt on this! This has been going on for yeasrs. And shame on western mainstream media for supporting the official narrative and lie. The western mainstream media and its journalists should be denouncing the US establishment for supporting ISIS terrorists!. But mainstream media is corrupted and has sold itself to the devil to the official narrative lie that we have to turn to RT and alternative media like 21st Century Wire of Patrick Henningsen and other alternative independent media for the truth! Shame on you western corporate maisntream media! I totally agree. The first time I heard about and listened to Tulsi Gabbard I fell in love with her. Yes, she is attractive, but I was in love with her personality - her courage and integrity in speaking out truth. If I was an American I would give her the vote in any election. I despair in whether we can change this around when the elites control the media. Great show as always, Patrick. (Conitnued) Sorry, I pressed the 'ENTER' on the keyboard which posted the comment when I was not finished. Tulsi Gabbard said in plain, factual language what I have pointed out to other people that the US is supporting terrorists when we, the people, would be thrown in prison for doing that. And the media is not doing its duty in reporting the fact that the US and its allies are supporting terrorists, plain and simple! The western media is involved in blatant lies so huge that most people (Sheeple) would not believe! Thank you Patrick for highlighting this plain truth. Thank you Patrick! From frame: Tulsi Gabbard points out in simple language the fact that if you, I or any citizen were found to be supporting Al Qaeda/Al Nusra or any terrorist group we would be thrown into prison indefinitely without legal representation according to the NDAA. But it is okay for the political elites to support terrorist groups - using them as proxy armies in order to carry out regime changes of sovereign countries in the Middle East as they did in Libya and now in Syria. my question is inrelevent to today´s them, you metioned befor few days that flat earth is al "Psyop", can you expand on This?